Pious Act #1 is a syncretized secular ceremony utilizing visitor participatory performance as a tool of spiritual reverence and devotion. Through the objectification and ornamentation of the physical body, incorporating elemental forces, aural and religious objects, the body becomes a living altar. 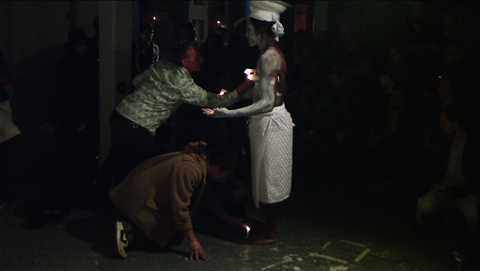 The performance itself can be seen as a physical act of piety and communion. Syncretism as a form of survival provides a context that historically binds the work to the African diasporic socio-cultural experience.